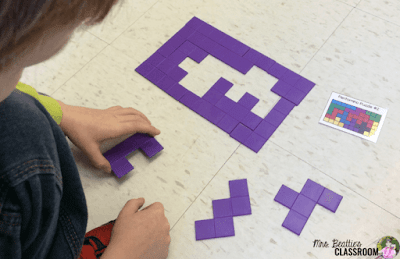 Study after study has proven that Guided Math is a powerful approach with big results in the elementary classroom, but many teachers are hesitant to get started because they lack the necessary background knowledge to pull it off effectively. 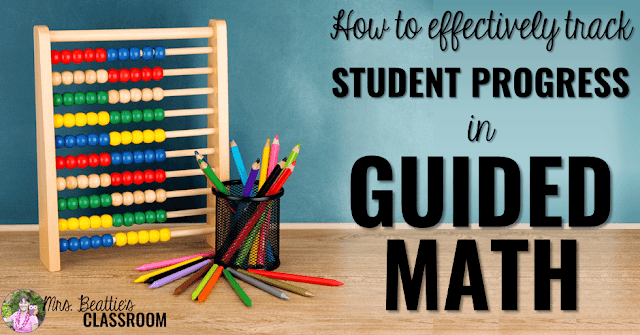 I get asked all the time about how I track student progress in Guided Math, so I thought I'd share three things that make this tracking process simple! As I explained in my last post, when I refer to centers as independent, what I really mean is that my students are working apart from my direct supervision. Since I am working with a small group on a directed lesson, my students must manage without my help. It also means that they must be accountable for completing the work just as I would expect them to if I were observing. The first step, as I mentioned in the first blog post of this series, is to have your expectations made very clear so students are 100% sure about what you want from them. Since I like to keep my centers very hands-on, there isn't always written output for students to turn in at the end of their time. 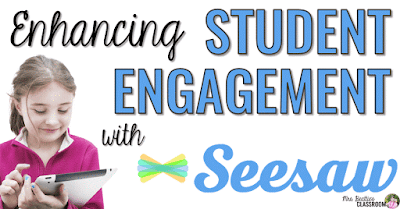 My absolute FAVORITE time-saving resource in my classroom is the free Seesaw app. 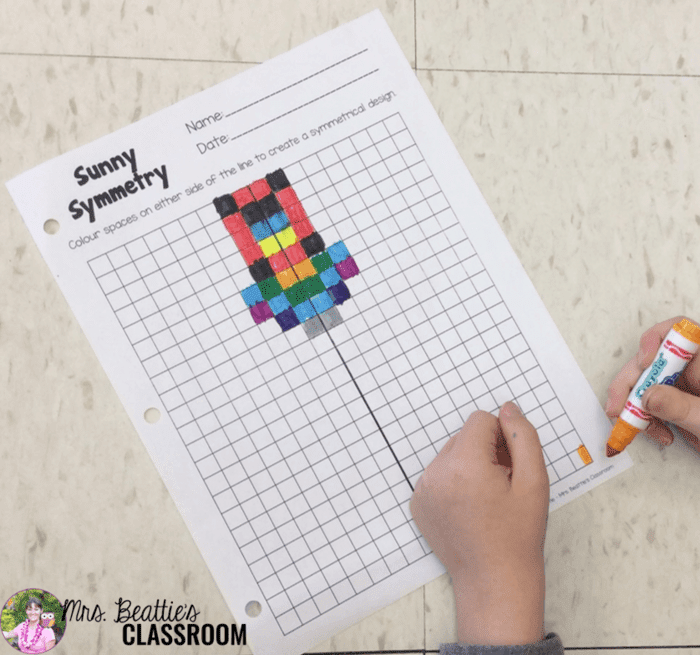 At the end of each of our Guided Math sessions, my students document their creations or explain what they learned using this amazing platform. You need only one device in your classroom for this to work effectively, although having more is certainly preferable. Seesaw works on iOS and Android devices, Kindle Fire, Chromebooks and computers with Chrome or Firefox. Ask your administrator to provide one. Appeal to student families or your own friends and family to donate any older, unused devices. Check on online buy-sell-trade sites. Check garage sales or second-hand stores. Consider setting up a Go Fund Me or similar campaign if your district allows it. You really won't be sorry. Seesaw has made assessment and progress-tracking so much easier in my classroom. If you're interested in reading more about this platform, there is another blog post linked at the bottom of this page! Assessing your small-group lessons is much easier to do, since all of the work is happening right before your eyes. The key is getting yourself organized to collect multiple types of student performance data. Collecting student work is straightforward and easy. If my students complete a paper-and-pencil activity I can collect it (or have them document it using Seesaw) and can assess it at a later date. Another form of written student work that I like to use is the exit slip. If my students have completed a largely hands-on, demonstration type of lesson activity, there isn't necessarily any written output. An exit slip allows you to capture a quick snapshot of student learning during the session in a two-minute written task. I love to use sticky notes for this! I keep a page for each of my students in my Guided Math lesson binder and collect all of their exit slip stickies in one place. Until well into my career as a teacher we were required to have written output to document student progress, but as the education system continues to change, teachers have been given more freedom to rely on professional judgement, and our observations of student performance in the classroom have become as important as the written work. What is important to note with observation is that you really should have a system for documenting it, or reporting will be a challenge. 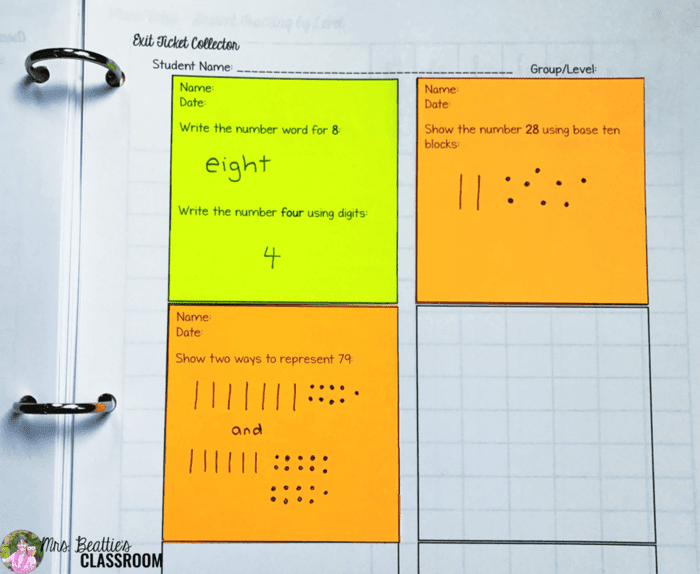 During my Guided Math lessons I use observation forms that I print on sticky notes. 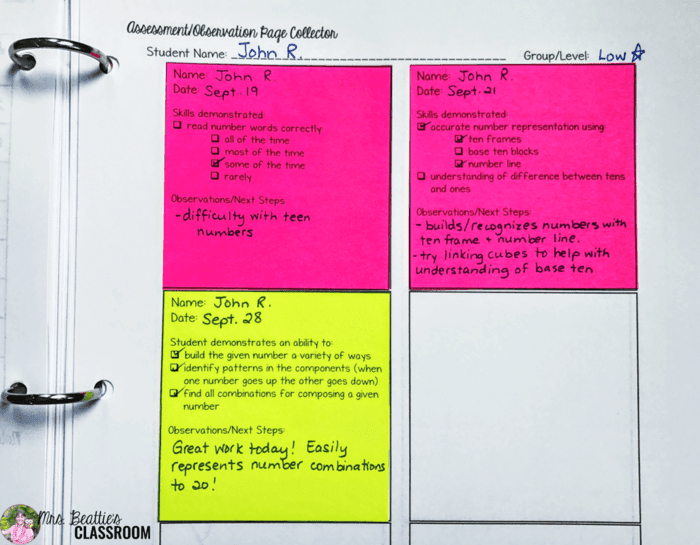 These forms are usually quick checklists related to the curriculum expectations or standards the lesson focused on, as well as a small space for me to jot down necessary notes. Again, I print these on sticky notes so that I can collect them all in one place in my lesson binder. It is a big job to prepare all of the differentiated assessment forms and activities you'll need for Guided Math. 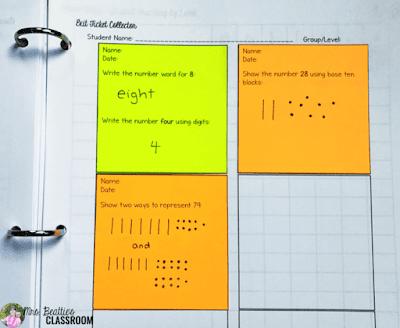 My Guided Math Centers will take the work out of planning independent work and provide you with many opportunities for collecting written student data. My Differentiated Lessons contain all of the exit slips and observation forms you'll need, plus an editable version so that you can create slips to exactly meet the needs of your individual students. 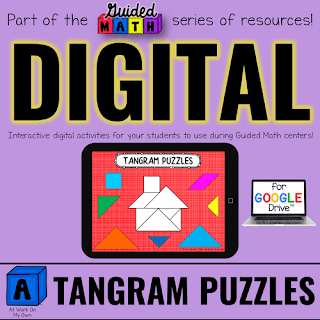 And take a look at my newest addition to the Guided Math family of resources - digital activities for the "At Work On My Own" category! These contain helpful documents to help you teach your students to upload their work into the top education apps, including Seesaw! 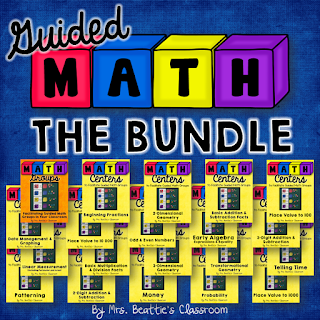 Love all your posts on guided math. Just wondering how often you do centers with your class? Is it the bulk of your math program? I try to do centers as often as possible, because it is during that center time that I am teaching my focused, small-group lessons. Sometimes, though, I will use the centers as a whole-group activity. I try to let the needs of my students guide my practice! how do you print on stickies? !